180-Gram audiophile grade vinyl pressing available July 20 via Zappa Records/UMe. Chunga’s Revenge was one of three albums that the highly prolific composer released in 1970, following Burnt Weeny Sandwich and Weasels Ripped My Flesh. Although released under Frank Zappa's own name, the album is most notable for introducing a new Mothers lineup that included the Phlorescent Leech (Flo) & Eddie, the pseudonyms for former Turtles members Howard Kaylan and Mark Volman who performed under the aliases due to contractual restrictions. The reconfigured lineup included bassist Jeff Simmons, keyboardist and trombonist George Duke, drummer Aynsley Dunbar and multi-instrumentalist Ian Underwood. Derived from various sessions during that year, the record ebbs and flows between instrumental and vocal tracks and as noted by Zappa on the original sleeve, “All the vocals in this album are a preview of the story from 200 Motels,” his acclaimed film and soundtrack released the following year. 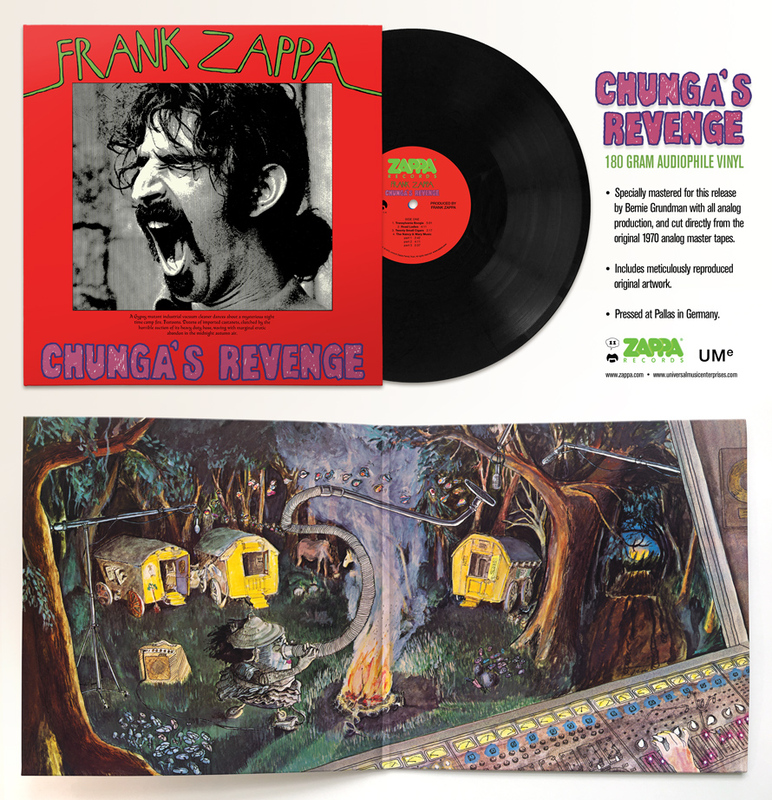 From the funky guitar workout of opener “Transylvania Boogie” to the bluesy send-up “Road Ladies” to the jazzy “Twenty Small Cigars,” a standout recorded during the Hot Rats sessions, Chunga’s Revenge is an eclectic affair that sees the ever-restless musician and his adroit band traipse through a variety of genres with aplomb. The album’s centerpiece, closing side A, is “The Nancy & Mary Music,” an almost 10-minute long three-part improvisational suite recorded live that sees each Mother flexing their musical muscles for a freewheeling freak-out of epic proportions. Side B opens with the hard rocker “Tell Me You Love Me” which gives way to the warped pop of “Would You Go All The Way” and the jammy title track, propelled by Ian Underwood’s wah-wah pedal sax solo. The album closes with two songs that showcase the vocal talents of Flo & Eddie: “Rudy Wants To Buy Yez a Drink,” Zappa’s jaunty, tropical-tinged response to his experiences with the Musician’s Union, and “Sharleena,” a soulful ballad that see Zappa putting his unique spin on doo-wop and R&B.